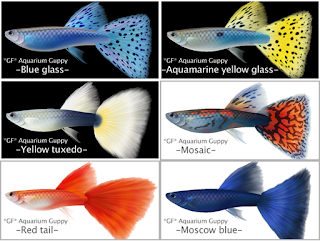 Fish rezzer and fish require the Aquarium series tank. 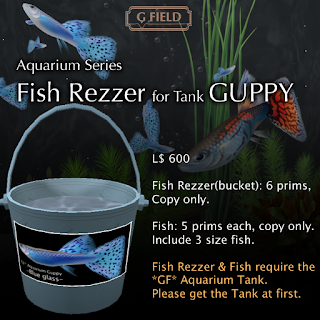 Please get both the Tank and the Rezzer to enjoy your aquarium. Include: Bubble particle, 6 frame texture, Bubble sound(sound on/off, volume set). Prims: 5~32, please check detail at the store. Prims: 5 prims each, include 3 size fish. Set up is too easy! Rez the tank and rezzer, touch the rezzer then select fish size and the number of fish. That's all. 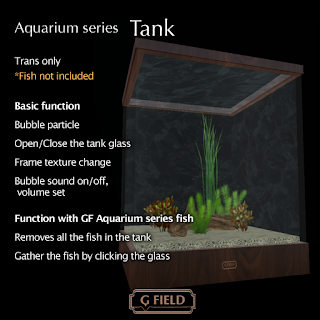 Fish will go in the tank automatically! You can release an unlimited amount of fish.